She found an interesting-looking room and contacts you: "Come on over." So you make your way over only to find she's gone off somewhere. What choice do you have now but to find a way to escape on your own? If this scenario sounds exactly like the kind of situation one of Tesshi-e's friends would stick you in, that's because it is. All in good-natured fun, of course! In order to Escape from the Room with Framed Pictures, you can expect your resourcefulness to be tried as usual. Point-and-click your way around the room; grey bars on the edges of the scene indicate where you can move while clicking on certain areas allows you to zoom closer and examine suspicious-looking objects. Although you won't be aided in finding these active spots by the unchanging cursor, Tesshi-e's crisp, photo-realistic visuals eliminate pixel hunts. Instead, all your efforts will go into solving a steady progression of increasingly clever puzzles. There is a plainness to this room, despite the smattering of decor, that harkens back to Escape from the Room with No Furniture. Here, most of the puzzles revolve around eight framed pictures hung along the walls. Sure, the iconic wobbly picture frame makes a reappearance (you'd miss it if it were gone). Yet Tesshi-e always finds fresh ways to be whimsically playful and is very gregarious to include you, the player, in a cooperative sense so we all feel like friends involved in these shenanigans together—another reason we love Tesshi-e so much! Starting out easy, clue collection and puzzle solving flows very smoothly, with enough brainwork and inventive visuals to keep it entertaining yet relaxing. But, half-way through you'll need to use your inventory in less-than-intuitive ways. Somehow this is to be expected, though, knowing our illustrious game designer, and it all adds to the great fun. Of course, there are two endings to be had, so save your game before walking out the door. There's nothing to disappoint in the Room with Framed Pictures, and it may even be your new favorite escape! "Happy Holidays!" Escape from the Room with Framed Pictures Walkthrough now available! A table compass that has a key inside it, and a knob that doesn't do much yet. Let's inspect the bench. It has a key that's chained on, and a series of symbols. Better note it! 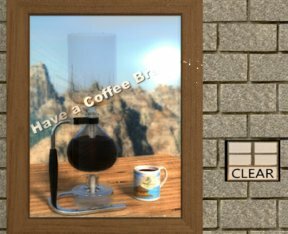 There's a Coffee picture offering us to "Have a Coffee Br". It will take a code of 4 buttons in a square. On the table, there's a Mr. Birdy code box with 'Blue, Red, Yellow' under the buttons. It's missing a Mr. Birdy- even if we had a code, we can't use it. There's a relaxing picture of rocky shore. Clicking on it reveals a set of four buttons in a square and the instruction to 'Make an answer'. Hmmm, curious. There's also a sunset picture that's attached with screws. There's a pretty River picture that wobbles- because it wouldn't really be Tesshi-e without a wobbly picture. There's a Flower picture. Click it to receive Water Note. Notice the safe behind it. And finally, the chest of drawers. There's a locked drawer, an open empty drawer, and a drawer that takes a Left/Center/Right code. On top, there's a box with a button that does nothing... but click on the white box at the base to see that there's no power. This code is connected to the 'Make an answer' buttons. That's right- you make the code that will be correct. Whatever you want it to be, as long as it alternates buttons. Repeat the pattern at the Coffee Break panel. You'll need the Spade Key to open this drawer. The bench clue and the Can. Use it on the vase in the Table View to see a pattern and note a submerged key. Receive a Magnet. Hmm, it might fit in those gold rings next to the lever. It'll stay open! Remember that key in the water? Let's try to get it. First, we'll need something long. Hmm, the stick isn't helping us. Maybe we could scoop it with the Can? Receive a ball with a Diamond Key inside. You'll need the Mr Birdy figurine, and a paper hint. The paper hint needs 'Water'... we have some water in this Can of ours. Now that you've received the Diamond Key, you can open the safe behind the floral picture. Hm, there's a tool I can't reach down there... I need something long. You need a key for this... where can we dig one up around here? You may have noticed that we've seen 4 'NEWS' boxes, on each wall. If we look at the table compass, we can see that the north arrow is pointing towards the Table View. You'll want to go around the room and select the letter of the direction it is in relation to this Table Compass. Use your Heart Key to escape! These aren't full numbers- we can't use them. Maybe there's something we've seen before that can help? Happy coin will bring happiness to you! Atleast I haven't stumbled across something like it before. Any idea what the "make an answer" clue means? A shiny new Tesshi-e! Excellent! ..and of course, I'm in a jam already. The order you choose is the solution of the coffee painting puzzle. The key will always stay on it's chain. Thanks, I was driving myself a bit crazy. I'm still missing something to attach magnet to stick- any hints? Just found out that i't stays on the chain even for the happy coin end. I have a Mr. Birdy clue and I'm pretty sure I know the answer, but I have no third Birdy for the machine. I can see a spatula and can't reach it- and have no tape to attach the magnet to the stick. The magnet says it's too short to open the electric box on top of the chest of drawers- and for some reason a metal chain can't be used as a replacement. In this game water conducts electricity. a tin can with the card symbols on it. But no clue on how to proceed... yet. Thanks, OldCheese! I'm out with a Happy Coin! What is in the urn? What is left in the can after retrieving the key? Do you have anything else in your inventory that mentions this element? Assuming you've found the red bird, where might this clue be point you toward? Blue, Red, Yellow -- but how does that correspond to dewee?! Maybe look for another pattern.. The sequences is reD, bluE, yelloW, bluE, bluE -- tada! tape! - Unlocked the little door so I can see the spade thingy, but I don't have tape to keep the magnet against the stick. - Wet the note, so now it says "dewee" but I have no idea what that means. - Added the third Mr. Birdy, but no idea what to do with the colors and the box with the Blue/Red/Yellow buttons. I have found absolutely no way to proceed. I feel stupid but I'm stuck with just the paper. Any hints on how to proceed? I just saw your comment haha. If only I had waited a moment longer my questions would have been answered...Thank you for posting that! Can you make sense of the 'numbers' on the second display in the compass table? Nope.. Is there anywhere else you've seen a similar display? What happens if you merge the two displays? Where might you put that new four digit number? The buttons for that one are the same as for the rocky beach painting, with the 'make an answer' prompt. You need to input a sequence (any sequence whatsoever) long enough to spell coffee on the display and then go to the coffee painting and input the sequence you just created. Perfect. Tesshi at his best. Woo! I beat a Tesshi-e without help! it's not really a hassle to go for the second ending. Otherwise you have to guess what to do next. it unlocked the thing I was holding! This is the era of the key that can be used without you having to be holding it. Tesshi-e is my favorite. I feel so good whenever one of these tesshi-e games comes up. The music, the attractive designs of rooms I'd actually like to be in, the signature details and style of the puzzles. And another big plus: the payoff at the end actually feels worth it. For the NEWS boxes, I had been setting them to the appropriate letter as I encountered them, but when I set the last one (the S) the compass table refused to open. I had to go around the room and turn all of the boxes off (nothing selected), then go around again and set them appropriately, and then the compass table deigned to open. It didn't work for me the first time either but that was because I had one set incorrectly. ...which was using the water to complete the electrical circuit. I felt like that was a weird jump in logic and not particularly intuitive. I had to use the walkthrough for it because I was stumped. Otherwise, all the puzzles made sense and it flowed logically. It wasn't too easy, but not too "how the hell was I ever meant to think of that?!" This game required a bit more thought than the standard Tesshi-e game which wasn't a bad thing, but it also required a couple leaps of faith that was not so good. The wire puzzle was one that comes to mind as well as the Mr. Birdy puzzle. That one was just a bit stupid and lazy. Come on Tesshi-e! After I tried all of the ideas I had for creating a long enough thingy to connect the two ends of that circuit, the next thing I thought of was water (because I had some and I was looking all around for ways to use it). But, since that can be considered outside knowledge, there could have been some clue somewhere to indicate that water conducts electricity. BUT, since it's also technically outside knowledge that electricity exists, then who doesn't know that electricity exists and who amongst the people that know about electricity don't also know that water conducts electricity? Everybody knows about water and electricity and even though a wacky drawing hidden behind a cabinet describing the water vs electricity mystery would be a welcome jog to our memory, its absence does not create a leap of logic. It's more of a leap of logic for me to try to put the key in with the magnet to complete that circuit. I didn't find the wire puzzle to be expecting too much from us. One has to bring certain basic knowledge to these games: Magnets attract some metals. Water is wet. Hollow balls are buoyant. A little box with wheels made from a sliced-up dowel will roll downhill. Unlabeled boxes the size of a breadbox will heat/melt/bake things left inside them. And so on. Love these games. My problem is that the ads constantly load and reload about every two seconds. For me it makes the game very sluggish. Most of the time I don't know that I have solved something because there is a lag in the response. I don't mind ads but maybe have static ones. Not the ones that are constantly reloading. I use Chrome - maybe it is a chrome issue. I don't know. It just takes away the fun of these games. Controlling ads: You can turn off Java plugins (which is what most of the ads are) in the settings menu (chrome://settings/). Select Settings - Advanced - Content settings (under Privacy) - Plugins and select "click to run." Now when you encounter a Java plugin you want to play (like a Tesshi-e game) you can click on it and allow it to run. In addition, I always resize my browser window to be the same size as the game I am playing. Whether you have Java enabled or not, this is a simple way to prevent distracting imagery from interfering with the game atmosphere. I hope that helps you enjoy the games more.